Abelia Brody had a love for music. One of the few people in Lily Springs to even own a phonograph, Abelia often sat on her back porch into the evening hours, melodies blossoming from the horn of her "talking machine" and carried beyond her yard by the breeze of a summer's night. People on the other side of town could sometimes hear the soft voice of Enrico Caruso through their open windows, the curtains moving in the light breeze as if dancing to the music. She had a ritual on summer nights: music on the porch, the morning's paper from Dubuque and a bottle of her home-made wine. Her elderly neighbor, Rose, also enjoyed the music, although she was loath to admit it. Abelia lifted the tone arm from the disc and slid the brake, stopping the turntable in its rotation. 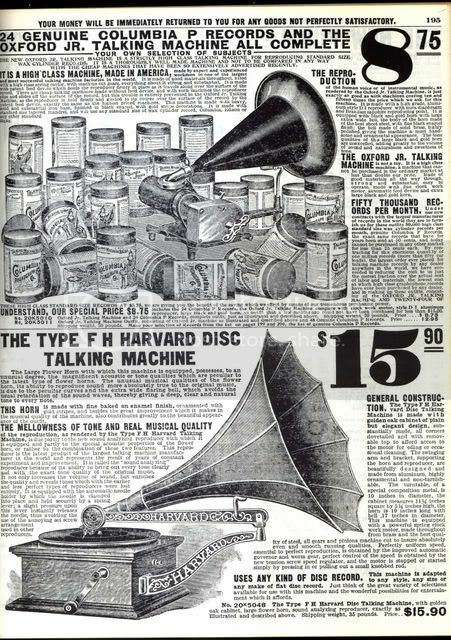 Her talking machine was a Harvard model, purchased from the Sears catalog in 1906 for $15.90. It had a large external horn and a nice oak cabinet that was now scratched and faded. The player was well worn but still produced good sound---good enough, anyway, for quiet summer evenings on the porch. She thought about buying one of the newer models that no longer had the external horn, but most of those were heavier and harder to move. The Victrola, for example, was contained in a large, wooden cabinet. It sounded better, she was told, but she rather liked her old model in that it could be moved to the outdoors rather easily. It sounded good outside and even Rose commented that she sometimes liked to fall asleep to the sounds of Abelia’s machine on a summer’s night. Except when she played ragtime music, that is. So, once the sun went down, Abelia refrained from ragtime and played some of the music that Rose said she enjoyed. Although Enrico Caruso was Rose’s favorite, Abelia usually capped the evening with “Ave Maria,” by the famous castrato Alessandro Moreschi. I love vinyl records. Unlike music today where everything is digital, listening to an album on a phonograph was a full sensory experience. Of course, you have the music. And unlike music today which is too perfect--too clean--music was always accompanied by hiss and crackle. But in never seemed to matter. You heard through the imperfections. In addition to the music, there was also the tactile experience of gently holding the album and examining the record sleeve and album art. I often did that lounging in a bean bag chair with the record playing on the phonograph. And I imagined Abelia doing the same basic thing. Records at the turn of the century were, of course, played at 78 rpm. The records were a little smaller than the LP standardized during the 1950s and lacked album art. These records were thick--very thick. Luckily, one of my turntables is able to play 78's and I have several of them from my grandfather's collection. However, nothing as old as what Abelia would have listen to. She had a box of records on the table and shuffled through them to find another one. She had been buying records since getting the Harvard and had acquired quite a collection over the last decade. Her love of music came from her mother, Colleen Brody. Her fondest memories were of her mother singing to her in bed or humming a tune in the garden. Near the back of the box she stumbled upon one of her favorite discs: “She is Far From the Land,” recorded by Irish tenor, John McCormack in 1911 on the Victor label. This was an old Irish tune that her mother sang to her when she was a child. Lifting it from the box, Abelia delicately placed the record on the turntable. After giving the arm a couple of cranks, she placed the needle onto the record and released the brake. Instantly, the melodic sound filled the porch. Abelia picked up her wine and turned down the lantern. Leaning against the porch post, she looked out over her garden, the light in the western sky fading into darkness. The first of the lightning bugs were out, glowing softly around the Evening Primrose. For her heart in his grave is lying. Like Abelia, I can sit for hours just listening to music (Abelia and I have a lot in common, actually). After cutting the grass in the summer, for example, I like nothing better than to sit on a bench, soaking in the sun with music playing through the iPod. My iPod has become much like Abelia's box of vinyl 78s. Pretty much every type of music can be found there. Everything, that is, except Alessandro Moreschi. I think Abelia would love iPods. I can picture her in her garden, walking among the fruit and butterflies, the white cords dangling from her ears. Abelia would fit nicely in the 21st century. Writing the chapters in Lilac Wine dealing with record players and music awakened in me a desire to listen to my music on their original vinyl. I recently fixed two turntables and have been cleaning and playing old albums. And I have taken it one step further: in addition to this blog, I have recently started an internet radio station dedicated to the playing of music on original vinyl. The radio station is called The Vinyl Voyage. There you can hear several different genres of music, just like the box of records in Abelia's dining room.